Oil wastewater irrigating our food. Fracking wastewater injected into our drinking water supplies. Oil drilling just feet from the homes and schools of low-income communities of color. These are just some of the injustices that our California legislators are allowing the oil industry to get away with, despite the fact that these processes use toxic chemicals, including many linked to breast cancer. In the past six years, the oil industry has spent $122 million on lobbying and campaign contributions to weaken regulations and expand drilling in California, the nation’s third biggest oil-producing state. In return, California legislators are failing to even consider meaningful legislation that would put public health before oil industry profits. Enough is enough. We’re calling on Governor Jerry Brown and our elected state officials to stop taking money from the oil industry so our legislators can actually put our health first. Join us for an evening with Dr. Sandra Steingraber, acclaimed ecologist, environmental activist and author of Living Downstream: An Ecologist’s Personal Investigation of Cancer and the Environment, to present the science behind this “Oil Money Out, People Power In” campaign. RSVP: Click here to RSVP for the event—the event is free, but seats may fill up quickly! Facebook: Click here for the event page on Facebook – please share it widely with your community! P.S. 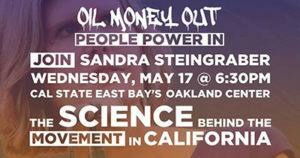 If you don’t live in the Bay Area, you can still participate in the larger “Oil Money Out, People Power In” campaign. Please sign the campaign petition and RSVP to attend the campaign rally in Sacramento at the Governor’s Mansion on May 20.